.... launch of the SES-4 satellite for SES aboard a Proton M/Breeze M launch vehicle from Baikonur by ILS. Crafted on the Space Systems/Loral 1300 platform, the liftoff will occur from Launch Pad 39. Poised to be the largest satellite in the SES fleet, SES-4 at 338 degrees East will replace NSS-7 and will enhance what is already the largest neighborhood in the Atlantic. 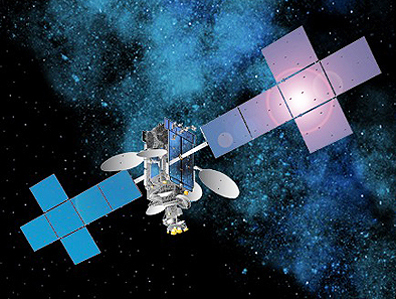 SES-4 will be a hybrid satellite featuring high powered C-band coverage and incremental global capacity, ideal for video distribution, government and VSAT services. The satellite’s Ku-band payload will provide enhanced coverage and capacity across Europe, the Middle East, Africa, Western Africa and Latin America. 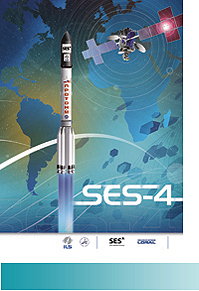 SES-4 will bring a substantial increase in the total capacity available at 338 degrees East. The state-of-the-art spacecraft has been specifically designed for its orbital location, with C-band beams serving the eastern hemisphere of Europe/Africa, full America’s coverage as well as a global beam to support mobile and maritime customers. Four high powered regional Ku-band beams will provide service to Europe, the Middle East, West Africa, North America and South America with extensive cross-strapping between C- and Ku-band transponders providing enhanced connectivity. The satellite will offer 52 C- and 72 Ku-band transponders with an anticipated service life of 15 years. The Proton M launch vehicle, using a five-burn Breeze M mission design. The first three stages of the Proton will use a standard ascent profile to place the orbital unit (Breeze M upper stage and the SES-4 satellite) into a sub-orbital trajectory. From this point in the mission, the Breeze M will perform planned mission maneuvers to advance the orbital unit first to a circular parking orbit, then to an intermediate orbit, followed by a transfer orbit, and finally to a geostationary transfer orbit. Separation of the SES-4 satellite is scheduled to occur approximately 9 hours, 12 minutes after liftoff. For ILS, this will be the Company's 20th SES satellite launch via an ILS Proton, the 21st Space Systems/Loral Satellite launched on an ILS Proton, as well as the 6th ILS Proton Launch in 2011 and the 10th Proton launch overall in 2011.